Why is this ring yellow or white? The Mother's Ring Builder uses yellow gold or white gold for displaying the styles, depending on the artwork available. This does not reflect the metal type chosen. Not sure? Use our ring sizer. 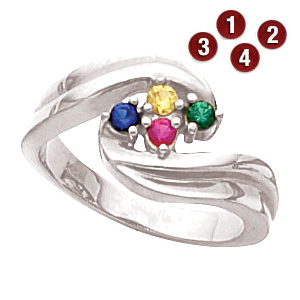 The sterling silver embracing arms mother's ring is set with your choice of four simulated round 3mm gemstones. Made in the USA. This item ships to the United States, Canada, Australia and Japan.